Amo Bessone, younger brother of Pete Bessone, another Reds alumnus and USA Hall of Famer, was enshrined in the coach’s category in 1992. Amo skated with Providence in the 1942-43 and 1943-44 seasons. After a year out of the game, he would return for a single game in 1945. He scored 1 point and 18 PIM in a total of 17 games. 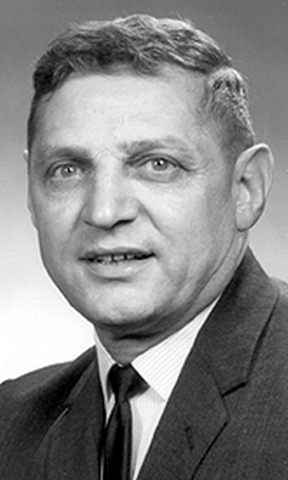 Bessone’s true hockey legacy lies in the 28 years he served as hockey coach at Michigan State University from 1951 through 1979, his Spartans won the NCAA national championship as a heavy underdog in 1966. He was one of the most colorful college coaches of his era with a trademark whistle he used to signal line changes. Intense behind the bench, he was warm and endearing off the ice. He regularly invited fellow coaches, officials and reporters out for drinks or back to his house for spaghetti following games. In 1983, Amo received the first John MacInnes Award. The award, given out by the American Hockey Coaches Association, recognizes great concern for amateur hockey and youth programs.